On February 24-25, 2017, the Centennial Wrestling team competed in the 3A/4A East Regional Tournament. The Eagles started extremely strong on the first day of wrestling after all four wrestlers advanced to the semi-finals the next day. Sophomore Jason Kraisser (138) won with a tech fall 17-1, junior Jacob Blyukher (132) won with a fall, senior Amr Narmouq (160) won with a major 11-1, and lastly, junior Lucas Shapiro (195) won in overtime with a score of 7-5. On the second day of regionals, Kraisser and Narmouq both won in semi-finals and advanced to the finals. Blyukher and Shapiro both had unfortunate losses in the semis and were placed in the consolation bracket. In the finals, Kraisser pinned his opponent in the second period and became the 3A/4A Regional Champion. Narmouq lost in the finals with a tough 7-5 loss, however, he still advances to States. Overall, the Eagles finished Regionals with Kraisser (1st place), Narmouq (2nd place), Blyukher (5th place), and Shapiro (5th place). The 3A/4A State Championship is on March 3-4, 2017 at the Show Place Arena. On Friday, February 24, the Boys’ Varsity Basketball team played their biggest rival, the Mount Hebron Vikings, for the first round of the 3A State Playoffs. More than an hour before the game, the Centennial student section was completely filled in anticipation for the big game. From tipoff to the final whistle, the Eagles kept a lead. The first quarter was electrified by the energy of both teams’ fans. Centennial’s transition offense and physical defense was no match for Hebron’s play. By the end of the first quarter, the Eagles were up 17-9. In the second quarter, Centennial still had a lead, but Hebron was closing in. By the end of the quarter, Centennial was ahead, 27-21. The Eagles came out with more intensity than ever before in the second half. Clutch offensive plays by senior Elijah White and great defensive plays by junior Andrew Hohmann kept the Eagles ahead. Also, a dunk by junior Hayden Ford impressed the spectators and further increased the Eagles’ energy. By the end of the third quarter the score was 42-26. In the final quarter, the Eagles’ win was sealed. 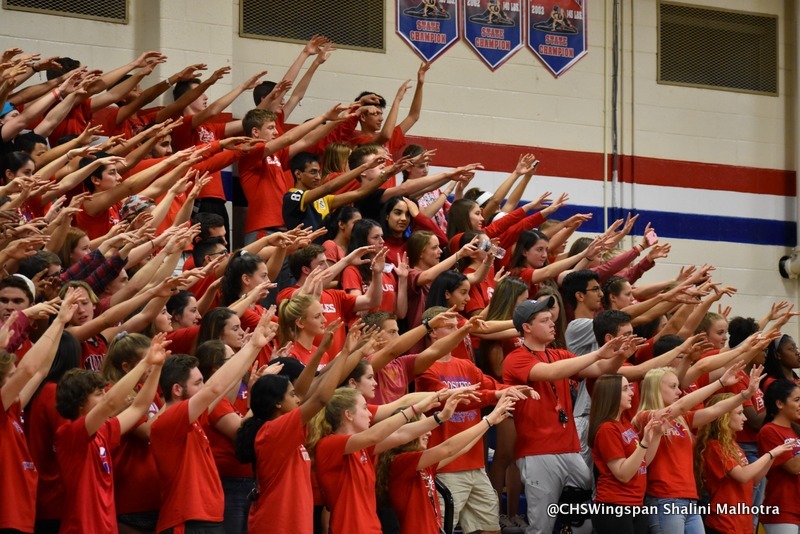 Centennial will play Long Reach High School on Tuesday, February 28, for the second round of the playoffs. On Saturday, February 25, two Centennial teams competed in Moody’s Mega Math Challenge. This year’s problem required students to create a model that would determine the overall risk posed to specific national parks as a result of climate change. Though the real-life application area of mathematics was not something most competitors were used to, Byun still hopes both teams finished well. The competition results will be announced in April. On February 25, ten Centennial students, divided into two teams of five, will compete in Moody’s Mega Math Challenge. The Challenge requires each group to work with one teacher-coach to solve a 14-hour applied mathematics problem. Past problems have included those related to car usage, the value of higher education, and student nutrition. Robert Kennedy and Timothy Watson, two of Centennial’s math teachers, plan to lead the two teams. The problem will be received at 7 a.m. and a solution will be uploaded at 9 p.m. Ten students were selected to represent Centennial High School in the Challenge this year. Mr. Kennedy and Mr. Watson chose these contestants from a group of 15 with the help from Elaine Whalen, another Centennial teacher. A panel of 225 Ph.D.- level applied mathematicians will determine the Challenge finalists sometime in April. Scholarship prizes for the competition total $150,000, and the grand prize is $20,000, which is divided among the winning team members. Kennedy discussed the prospect of a future program that would start training competitors as ninth-graders, which would increase the chances of Centennial teams taking home a win. On Tuesday, February 21, the Centennial Indoor Track and Field team competed in the State Finals. For the Boys’ 4×800, juniors Greg Costello, Daniel Gao, Steven Mitchell, and senior Anthony Ferrera came in 7th place with a time of 8:39. This was a very good accomplishment for them and a strong finish to Ferrera’s last indoor season. For the Girls’ 4×800, junior Claudia Pilcher and seniors Alli Krahe, Mary Monroe, and Olivia O’Connell finished in 6th place with a time of 10:10. This time set a new indoor record for Centennial. For the 1600m, sophomore Alison Betler came in 9th (5:30) and junior Kirsten Wikner came in 11th (5:33). For the 3200m, Betler came in 8th (12:22), sophomore Cora Blount came in 9th (12:25) and senior Kara Taylor came in 10th (12:26). On Friday February 17, the Centennial Eagles Girls’ Varsity Basketball team faced off against the Howard Lions for the Eagles’ Senior Night. Seniors Sandy Eichhorn and Jasmine McCree were both honored before the game. Though the Eagles played hard, they fell short to Howard, losing 42-55. Freshman Rasa Welsh and McCree both led the team offensively, scoring 13 and 12 points respectively. The Eagles will play on Friday, February 24, against the Reservoir Gators in the first round of playoffs. On February 17-18, the Centennial Wrestling team participated in the Howard County Championship. The Eagles had four wrestlers that earned spots at Regionals: junior Jacob Blyukher (132 lb. weight class), sophomore Jason Kraisser (138 lb. weight class), senior Amr Narmouq (160 lb. weight class), and junior Lucas Shapiro (195 lb. weight class). Kraisser came in first place in the County Championship and earned the No. 1 seed in the 3A/4A East Region Tournament. Blyukher came in second place and Narmouq and Shapiro came in third place in their respective brackets. The wrestlers will compete in the Regional Tournament on February 24-25.